After just yesterday pictures of what was said to be the back of the next 9.7-inch iPad leaked, showing design taking cues from the iPad mini, today we have designer Martin Hajek’s interpretation of what the fifth-gen iPad could look like. Inspired by the back cover and assuming a narrower bezel for the 9.7 iPad refresh, these 3D renders look convincing, even though there is no guarantee Apple will release a device looking like that. With that in mind, we do like the look and you can see how such an imagined iPad would look against the iPad mini and existing iPad. The biggest question seems to be whether Apple can afford to narrow down the bezel like this without getting accidental swipes to interfere with the experience. 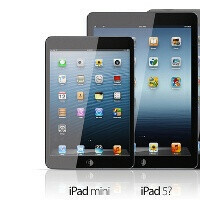 Take a look at the new iPad renders right below and let us know how you like it. A pity it's not 16:10, which is the ideal aspect ratio all things considered. You can adjust any text to 10:16 which is ideal for browsing, e-book reading etc., or 16:10 if you prefer that ratio, but you can't really adjust 16:9 or ultra-widescreen video to 4:3 unless you cut out half the source. At the top-end, these gadgets are multimedia machines, and I don't like the idea of giving 600 bucks away for something I can't enjoy a good video on. Wasn't this thin bezel thing already covered twice a week or so back? I have an ipad 2 and wouldn't change it for any tablet in that price range offcourse.The best app selection,simple intuitive UI the whole family can use it,just to tell that i didn't have reboots or system crashes,not once.I have my xperia p to satisfy my tech need while the ipad is a great companion for the entire family and a gaming console.